Each network device is given a "certificate" to prove its identity and, in some cases, allow it to issue other certificates. Certificates that can issue other certificates are known as Certificate Authorities. Certificate Authorities can create and sign for other certificates using their own private keys to verify that the signed certificate is trusted. You manage those certificates used by the Smoothwall to sign for services, such as, the Guardian's HTTPS inspection policies, here. An italic certificate Name indicates a missing root certificate. The Certificate column indicates when that certificate or Certificate Authority (CA) expires. Those that expire within the next six months have amber text. Certificates expiring within one month are colored red. Those in bold text have expired. Certificate Authorities, that is, those that can sign for other certificates are indicated with an icon in the Key column. This column also indicates the algorithm used to encrypt the certificate, as well as the key size. Note: Certificates for VPN services are still managed from the Network > VPN > Certificate authorities page (see Working with Certificate Authorities ). You can use a Certificate Authority as the Certificate Authority used by services specified on the Certificates for services page. Any intermediate certificates or Certificate Authorities are created and managed automatically, creating a single continuous chain of trust. This simplifies the certificate management process by allowing you to only export the one Certificate Authority, and import just that to all client devices. On first boot, if a default Certificate Authority does not exist, it is created automatically. Alternatively, you can manually create or import one. certificates are automatically created by the Smoothwall for its services. They are regenerated as required (such as on hostname change) so we do not recommend you export these for use with client devices. As these are signed by the default Certificate Authority, you should export that as the top of the trust chain. 1. Go to System > Certificates > Certificates for services. 2. From the Certificates section heading, click New root CA. • Name — If required, enter a meaningful name for this CA. This is only for information purposes and doesn't form part of the root CA. The entry for Common name is used by default. • Common name — Enter the name to be used for this root CA. Typically, this refers to an organizational role, such as, This School District's Root CA. • Organization — If required, enter the organization's name for this root CA. The default organization name is the one for the Smoothwall entered at registration time (see Accessing the Smoothwall ). • Comment — If required, enter an optional description. New certificates are automatically valid for 3 years from the date of creation. The key, also known as the fingerprint, is automatically generated using European ECRYPT2-2010 recommendations. It is suitable for long term protection, and is expected to be secure until the year 2040. 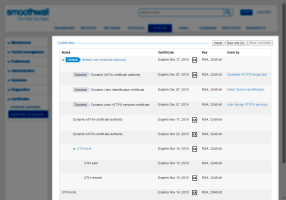 You can add new individual certificates to a root CA. 2. Highlight the relevant root CA. • Authority — You can also create a certificate that is also a Certificate Authority. When created, it is indented under its parent CA, and certificates that it can sign are indented under it therefore creating trust chains. Clear the selection to create a non-CA certificate. • Name — If required, enter a meaningful name for this certificate. This is only for information purposes and doesn't form part of the certificate. The entry for Common name is used by default. • Common name — Enter the name to be used for this certificate. Typically, this refers to an organizational role, such as, This School District's MITM Certificate. • Organization — If required, enter the organization's name for this certificate. The default organization name is the one for the Smoothwall entered at registration time (see Accessing the Smoothwall ). • Alternate names — If the certificate is valid for more than one domain, list them in the Alternate names box. For example, a certificate for the Google domain may also be valid for: www.google.com, www.google.co.uk, google.com, google.co.uk, and so on. You can also list IP addresses here. 2. From the Certificates section heading, click Import. 4. Locate and open the certificates to be imported. You can use CTRL to select multiple files. The Smoothwall analyzes the files for valid certificates and keys. If found, the certificates and keys are displayed in the Discovered Keys and Certificates section for each file imported. You are also advised if there is nothing to import from any of the chosen files. SSL certificates and keys can be "wrapped" in containers which require passwords to open them. If such a container is uploaded, you are prompted to enter the password to decrypt that file. 5. Click Import to complete the process. If nothing valid for importing is found, click Cancel. Typically, the Smoothwall creates a default CA that can be used by client devices. If you are using Active Directory, or have your own trusted Certificate Authority, you can import this and set it as the default CA. Client devices that trust this CA automatically trust any Smoothwall services assigned to Dynamic certificates in the trust chain. The following assumes you have added the relevant Certificate Authority (see Adding a New Root Certificate Authority). 2. Locate and highlight the relevant Certificate Authority. 3. Click Set default CA. 4. Click Save to confirm creating the default CA. Note: When the default CA is changed, those services using Dynamic certificates that are part of the trust chain, are restarted. The same procedure is used for exporting certificates and Certificate Authorities. 2. Locate and highlight the relevant certificate or Certificate Authority. • Certificate — This exports the certificate only, in PEM format. The certificate is most commonly used where a client device, application, or service needs to very the identity of the Smoothwall. • Certificate (binary form) — This exports the certificate only, in DER format. • Certificate and chain — This exports the certificate, and all preceding certificates in the chain up to the parent Certificate Authority. These are exported as a single .p7b file, in PKCS#7 format. The certificates are used to identify systems incapable of providing the full chain of trust. • Certificate and keys — This exports the certificate, and both the private and public keys associated with it, as a single .p12 file, in PKCS#12 format. The certificate and keys are used in systems which need to be able to sign or encrypt data using the certificate. 6. Download and save the files to a suitable medium. You should export the Default root certificate authority, and push this out to client devices on your network. 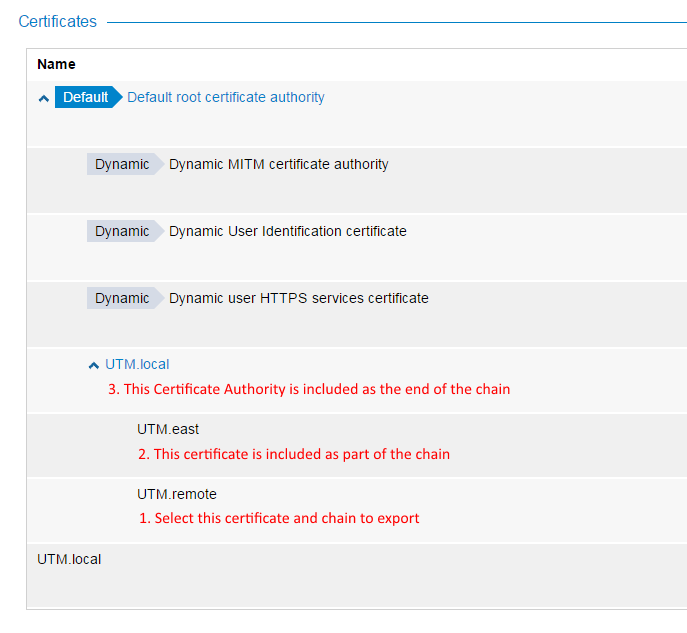 Any Dynamic certificates created as part of the Default root certificate authority's chain are automatically trusted. Modifications do not result in a redistribution. Your existing certificates are automatically imported into the new certificate management system, and assigned to the services they were used for previously. You may choose to leave them as they are. Alternatively, you may reassign services to Dynamic certificates in the default CA trust chain. If your client devices are part of an Active Directory domain, you can use the Root Certificate from Active Directory on the Smoothwall as the default CA. This avoids the need to push Smoothwall-specific certificates to the client devices. Note: It is assumed that Active Directory has the Certificate Services role installed, which is configured to automatically push the Root Certificate to clients. From the Active Directory server, take a backup of the root level Certificate Authority, including the private key. Import this into the Certificates for services page, and set this as the Default CA. 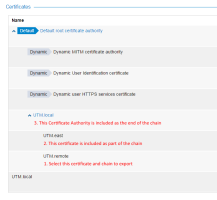 This automatically creates dynamic certificates suitable for Smoothwall services. Reassign the HTTPS Inspection (see Managing HTTPS Interception Certificates) and user-facing HTTPS (see Selecting the Certificate for User-Facing HTTPS Services) services to the appropriate dynamic certificates. You may choose to use a purchased certificate for user-facing HTTPS services. To do this you should import the certificate into the Certificates for services page, then reassign the service for user-facing HTTPS services to this certificate (see Selecting the Certificate for User-Facing HTTPS Services). Note: It is not possible to buy a certificate suitable for HTTPS inspection.